With HTC taking the Vive wireless at CES 2017, and Oculus working on its own standalone system right now, the tethers that currently bound VR will soon look as outdated as the Virtual Boy. 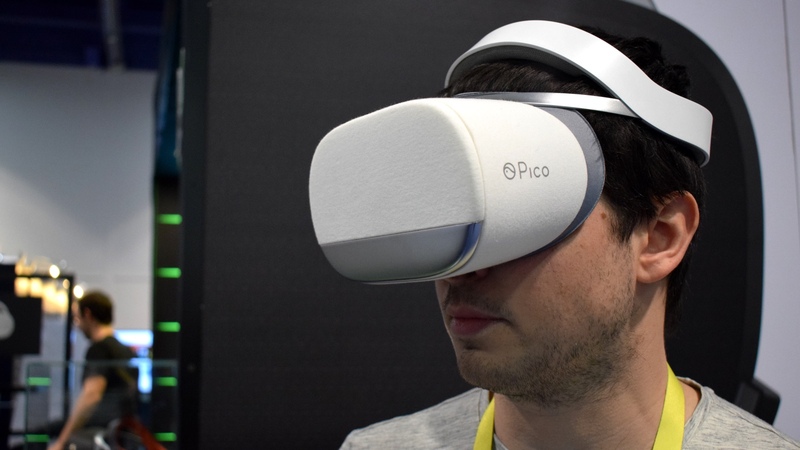 The Pico Neo VR headset is all about glorious untethered freedom, and at this year's Vegas expo I got to strap it on and take it for a walk around the show floor. The results were odd - in a good way. You see, we're still accustomed to many limits in VR, be it wires or virtual boundaries that keep us penned inside a designated area. The Pico Neo is completely boundless (virtually - obviously physical walls still hurt in VR) and it's a strange thing to adjust to. When I picked up the headset, all I had to do was find an area big enough that I would unlikely run into anything, and then pop it on. There was no setting up, no defining play spaces; just strap it to my face and go. The demo I played was essentially a recreation of Entrapment, with me as Catherina Zeta Jones dodging lasers as I made my way from one side of a room to a goal on the other. The system's inside-out tracking detected my movement without the need for any external sensors like the Vive's Lighthouse technology. With the added freedom it affords, total inside-out tracking - also featured on Microsoft's lineup of VR headsets - is where virtual reality is headed. At this point I should also mention there's no smartphone inside the Neo - unlike most other untethered headsets out there right now - with a 1.5k display per eye, gyroscope and accelerometer inside, powered by a Qualcomm 820 Snapdragon processor and delivering a 90hz refresh rate. There are also proximity sensors, so thankfully it will tell you if you're about to smack into a wall. The headset I tried on had a material cover that reminded me of Google Daydream View, but another on show had a plastic finish. It was comfortable to wear, with a PS VR-like strap keeping the Neo affixed to my head. As for what you'll be able to do with it, beyond dodging virtual lasers and gauntlets, Pico told me it will be launching a dedicated store and is working with developers to get software on it for launch later this year. It's yet to announce a fixed launch price, but did show me a prototype tracking controller it's working on, not too dissimilar to one of the Vive's wands. Technically, with the Pico Neo CV you could have a game where there are no boundaries at all. Though it would obviously require a massive play space, it opens up more exciting possibilities. While I'd have liked to have tried a few more games, I walked away from the Neo duly impressed; not just by the demo, but the strides which VR has made in such a relatively small space of time. Truly free virtual reality - the type we really long for - is just around the corner.